A wooden bus, simple but nice. This wooden bus is, in all its simplicity, a beautiful wooden toy to play with and to stimulate your child's fantasy world. Transporting children to school, driving the bus to the city center, making a long holiday trip to the mountains, ... is all possible in your child's fantasy world with this wooden bus. 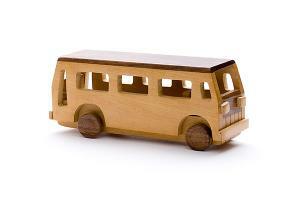 The bus is hand made and produced out of sustainable natural wood. The bus can drive on its four moving wheels. The bus is also perfect as decoration for your child's room. This bus is not only fun to play with but also stimulates the development of the gross and fine motor skills of your child. Each bus is individually branded by the natural grains of the wood and the touch of the craftsman.